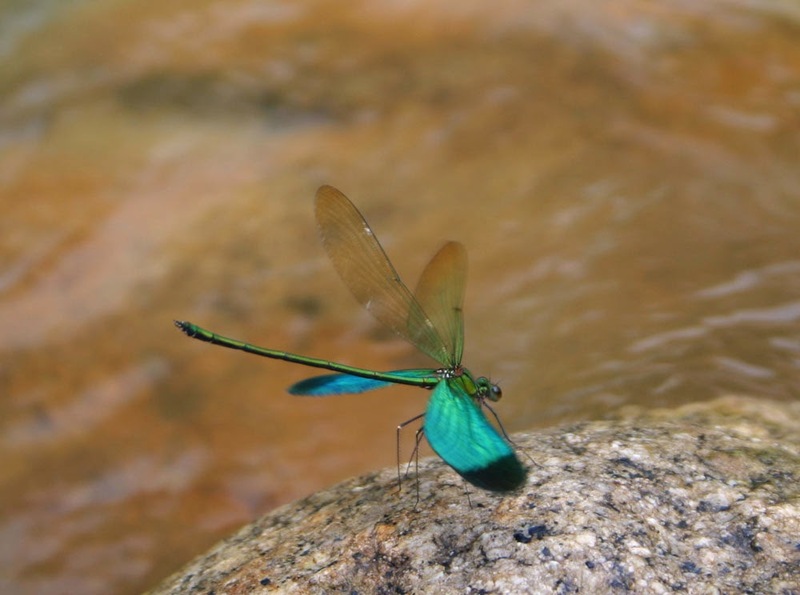 This is quite common Asian species and is one of the earliest known species of dragonfly. It was named by Linnae based on a picture in book cover of bird. And because in the picture the specimen was drawn with the wings in horizontal position, this species formerly was put in Anisoptera suborder by Linnae. Name of species is specified its locality, from China. 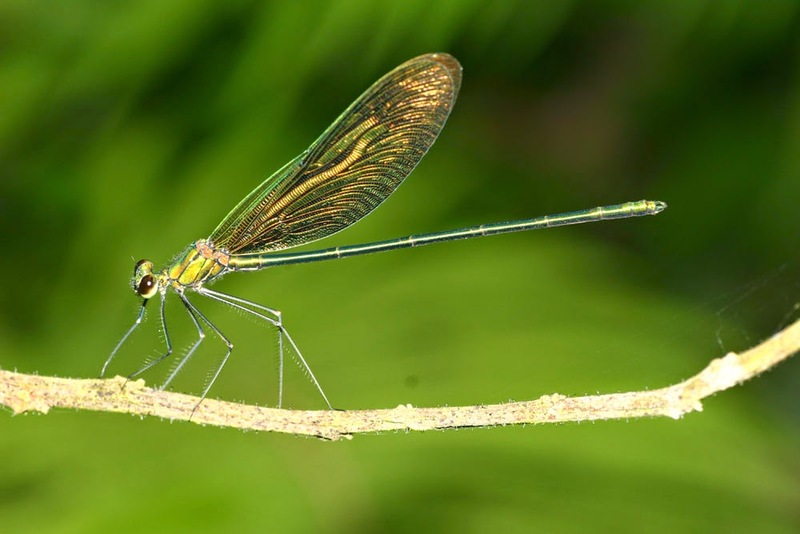 The medium sized damselfly, this species has shining green body and hind-wing is metallic green. The head, thorax and abdomen of the male are metallic green while female has fader green body. The wings of the male distinguish from them of the female. Female’s fore-wing has a white spot at pterosigma position – psedopterostigma, while male’s fore-wings are dust yellowish hyaline and instead of psedopterostigma, there is a white spot at nodus position. The hind-wings of female are shinning colorful, metallic green with an apical black patch on upper side and they are quite dust yellowish hyaline in female. They are very active damselflies, and live at open swift streams from low to high lands. They never fly far from their breeding habitat; males are strict in territorial defense by showing their flash metallic green hind-wings. Males fly very close to the water surface while females usually perch on vegetations nearby. 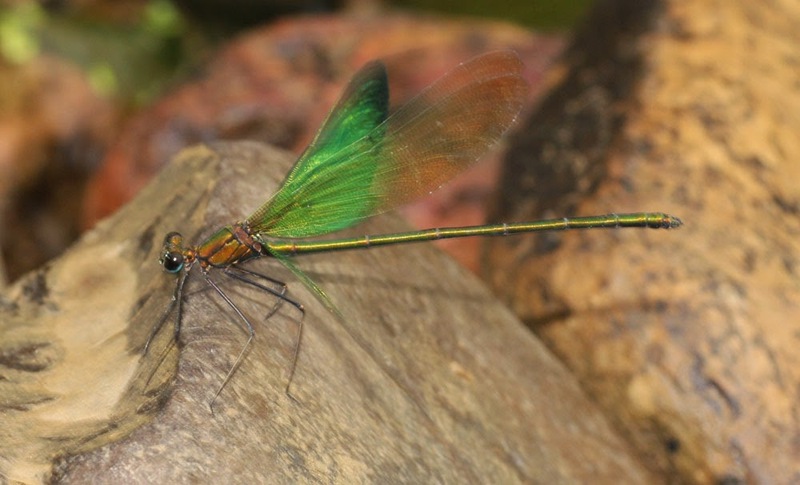 In courtship flying, males usually keep the hind-wing open in horizontal position to show the flash green upper surface of the wings under sunshine. Sometime males just clap their hind-wings as resting and the action is signal to other males in territorial informing or to coming females for mating. Females insert their eggs into aqua vegetation tissue; in many cases, female sinks in the water during the oviposition while the male around.